Another boys’ hockey term came to a close in March. 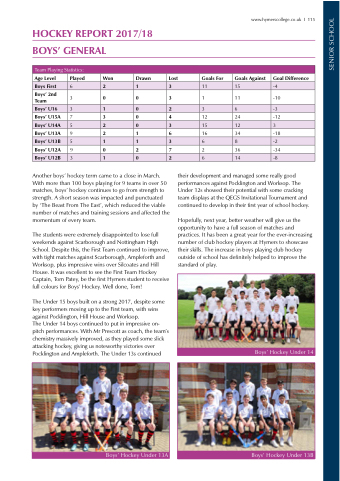 With more than 100 boys playing for 9 teams in over 50 matches, boys’ hockey continues to go from strength to strength. A short season was impacted and punctuated by ‘The Beast From The East’, which reduced the viable number of matches and training sessions and affected the momentum of every team. The students were extremely disappointed to lose full weekends against Scarborough and Nottingham High School. Despite this, the First Team continued to improve, with tight matches against Scarborough, Ampleforth and Worksop, plus impressive wins over Silcoates and Hill House. It was excellent to see the First Team Hockey Captain, Tom Patey, be the first Hymers student to receive full colours for Boys’ Hockey. Well done, Tom! The Under 15 boys built on a strong 2017, despite some key performers moving up to the First team, with wins against Pocklington, Hill House and Worksop. their development and managed some really good performances against Pocklington and Worksop. The Under 12s showed their potential with some cracking team displays at the QEGS Invitational Tournament and continued to develop in their first year of school hockey. Hopefully, next year, better weather will give us the opportunity to have a full season of matches and practices. It has been a great year for the ever-increasing number of club hockey players at Hymers to showcase their skills. The increase in boys playing club hockey outside of school has definitely helped to improve the standard of play.